This beer ended up being my second to last brew (sadly) of 2014. I did not hit my ATF limit of 200 gallons (which is my goal every year…maybe 2015 will hit the limit). Rounding out a really productive year this good beer, Moteuka Abbey Ale #2. Well, it’s probably pretty obvious that this is a second iteration of the Moteuak Abbey Ale I brewed about a month or so ago. There were a few things that I didn’t love about that beer that I thought I could do better. Primarily, the fermentation conditions of that beer were substandard since I racked the wort onto an entire yeast cake from a previous beer. A huge over pitch and I just didn’t like the harshness that I assumed came from the left over hops in the yeast cake from the previous beer. Those make me sound like the laziest brewer imaginable, but some days it gets away from me. The second thing I wanted to change is the grain bill. Previously in the Moteuka Abbey Ale #1, I used 10% “aromatic” malt. That was a little too much so I reduced it to 5% of the bill and this time I’m using a different maltster and they call it “melodoin” malt. I believe they are the same malt but just in case I’ll make the distinction here. Beer brought to a boil quickly, boiled for 90 minutes. Slightly undershot my volume. Pretty close. I like these hops but I don’t want to go too far so only one addition. Beer was fermented with a portion of the yeast cake from the Galaxy saison #3. This is a Blaugies strain of yeast. Fermentation took off in about 24 hours, high krausen after a few days and fell after about a week. Beer was left in the fermenter for two additional weeks, it fell pretty clear. The wort on this beer was so clear coming out of the mash tun, a very well behaved vorlauf and mash out. I love it when things go smoothly. 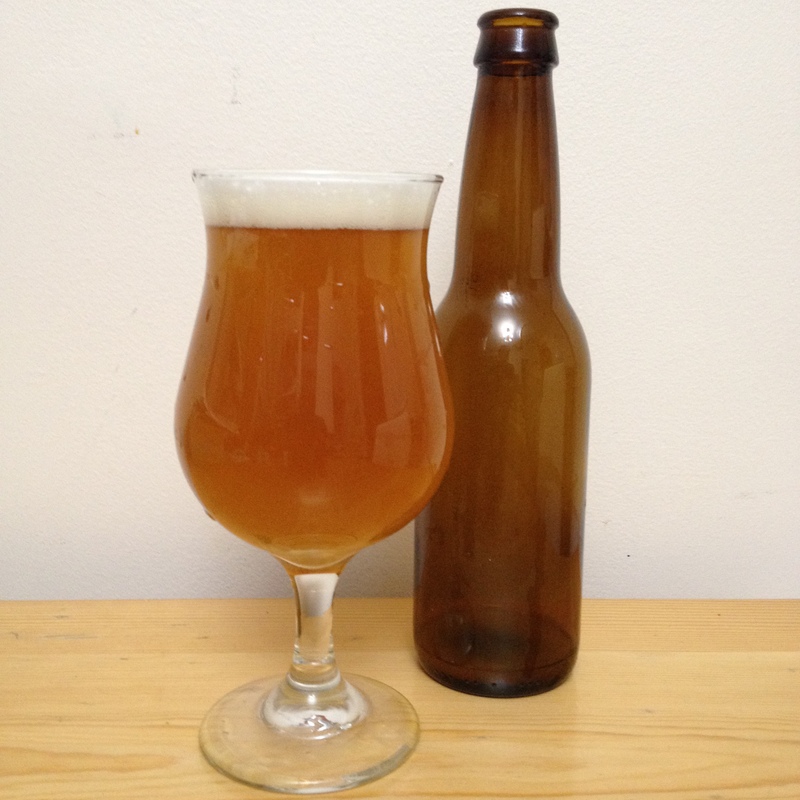 Beer is amber and hazy, a little under carbonated, white head small and medium bubbles, some lacing. Nice looking beer, could be clearer but oh well. Aroma is nice, hoppy, a little yeast esters sneaking through, can smell the malt but I wouldn’t describe the aroma as “malty”. The hop aroma is floral, earthy. It is like a noble hop on steroids, a little fruitier but not fruity. I like the aroma, the intensity is a little low but it smells great. Hmmm…I like it, but maybe some dry hopping in the next batch. I have to sort of fight my instincts on a beer like this. This is a beer that isn’t meant to showcase the hops and does a nice job with highlighting the malt bill better. This could be a good template to try out different malt experiments. I’ll have to wait and see I suppose. I have two beers in fermenters that will be posted soon (Chinook wet hop saison and a Falconer’s Flight saison) and some beer bottle conditioning (whiskey barrel aged Russian Imperial Stout). I wrote out my brewing schedule for the next four months, if I can keep to it, that will be great. I have 5 small one gallon fermenters going with different Brett strains in them right now, I don’t know when they will be done but I’ll keep everyone posted. My next brew days are a repeat of the Waktu saison but with WLP644, an English Old Ale (I have some Trecle for that), and a Witbier with citrus peels. Any advice about either of those styles would be appreciated. My next post will be about the physiology of yeast. That’s a long one so…sorry?